Fringed by palm shaded, sandy beaches on Lake Kivu's Gisenyi shores in the North West, Discover Rwanda Gisenyi Beach is an exciting addition to the growing chain of Discover Rwanda accommodation options around the country. 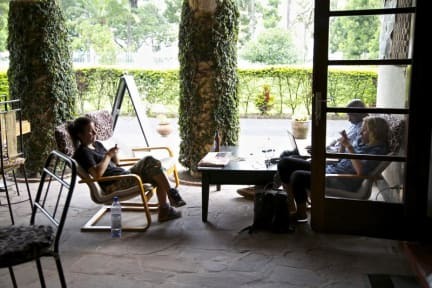 Set in one of Rwanda's oldest 'colonial' buildings with its unique architectural charm and a fantastic atmosphere, our residence will ensure that not only does this piece of paradise exceed your expectations, but it will also leave you with unforgettable memories of a wonderful stay. The building is of French design and is set in large, beautiful gardens. 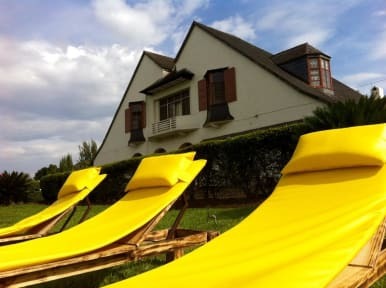 Discover Rwanda Gisenyi Beach Hostel, located 20m from the sandy shores of Africa's 6th largest lake - Kivu, is the perfect destination to relax & discover a piece of paradise on the tranquil lakeside beaches, water sports, mountains & many other activities while enjoying great Rwandan Hospitality! From the town, this is just a short walk and amenities such as the bus station are close by. From the border with DRC, the hostel is a convenient 1 km and a perfect base for trekking up Nyiragongo Volcano to see the worlds largest crater lake. Discover Rwanda Gisenyi Beach offers beautifully designed dormitories or private rooms with ensuite bathroom - ideal for travellers, friends and families. Most of the rooms have views over the gardens or Lake Kivu. Benefit from Gisenyi's most affordable, quality accommodation, food, drinks, high speed internet and the finest standards of service, Rwandan hospitality and the difference of supporting an important cause. Rooms have beds, bedding, bathrooms, cupboards, basic toiletries. Towels and lockers are available on request – with a small fee. Discover Rwanda Gisenyi Beach reception is open from 07:00 to 23:00 and at other hours only by special request with reception by telephone, email or in person. The reception closes at 23:00 every day and the bar around the same time except at the weekends or during events.